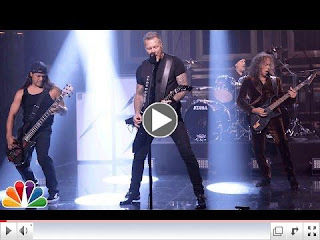 METALLICA made their Tonight Show Starring Jimmy Fallon debut on Sept 29 when they performed their new song "Moth Into Flame" for the first time on national television. "Moth Into Flame" is the second track from Metallica's forthcoming album "Hardwired...to Self-Destruct," scheduled to be release on the band's Blackened Recordings on November 18. The band world premiered the song on The Howard Stern Show on SiriusXM earlier in the week and shortly after debuted the video for the song, which was directed by Tom Kirk. "Hardwired...To Self-Destruct" was produced by Greg Fidelman and is available for pre-order in a variety of configurations HERE.